This year’s Esala perahera got underway with elephants very much in the news as the Department of Wildlife cracks down on elephants that are being kept as domestic animals without permits, and on the perahera (pageant) elephants. Among the officials designated to perform specific duties and tasks to ensure a smooth run of the Esala Perahera, veterinarians play an important role when it comes to the care of the pageant elephants. 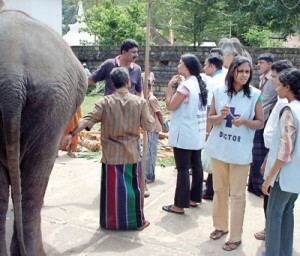 Professor Ashoka Dangolla of the Faculty of Veterinary Science, University of Peradeniya commenting on their duties said the vets check on the elephants, treat them if they are suffering from some ailment and give the final approval of their fitness to participate in the perahera. He said that there are eight Veterinarians and eight Veterinary Faculty students, in attendance from 4.30 in the afternoon–the time the elephants are brought to the Maligawa premises–until the pageant ends, for the ten-day period of the perahera. The elephants are tethered for the night. The team goes about their daily routine accompanied by a police officer. While the Vets check on the fitness of the jumbos, it is the policeman’s duty to ensure that the mahout is not under the influence of alcohol. If he is found to be so he will not be allowed to walk alongside the elephant. “The Diyawadana Nilame Pradeep Nilanga Dela is very keen to see that the elephants are well rested, cared for and are in good health. He does not like them to be used for work during this period,” Prof. Dangolla said. According to the Maligawa Perahera Karyalaya (perahera office), ten tuskers belong to the Maligawa. They are Indi Raja, Jana Raja, Buruma Raja, Miyan Raja, Thai Raja, Sinha Raja, Kaveri Raja, Migara, Eka Danta and Sindu. On the first day of the Kumbal perahera, 18 elephants took part in the Maligawa perahera. The total number with the Devala peraheras was 45. Of the 124 tame elephants found in the country, explained Pradeep Miyanapalawa who is attached to the Perahera Office, 75 were selected for the perahera but some elephant owners were facing problems and Mr. Miyanapalawa expects about 60-65 elephants to participate on the final two nights of the Randoli perahera. Commenting on the care of jumbos Prof. Dangolla said the Veterinary Faculty had special clinics to treat them. He also added that once he had to wear the sarong of a mahout before approaching an elephant that had been brought for treatment as the animals recognised their caregivers/mahouts through smell. During the period of the perahera some elephants are kept in the Maligawa stables while others are tethered in the compound. People living in the vicinity of the Maligawa bring food and water as they believe it is meritorious to feed the jumbos participating in a religious event. “At the end of the perahera season, some people offer poojas to ensure a safe homeward journey for the jumbos, Mr. Miyanapalawa said.